I moved to Vermont resigned to do all my shopping online. Coming from California’s Bay Area, where Target, Home Depot, Ikea, Toys ‘R Us, and virtually every other major chain store were less than 30 minutes away, I couldn’t imagine driving an hour or more for the kind of quick, cheap, and easy shopping I’d been used to; nor could I imagine that I’d find industrial-sized boxes of diapers or dirt-cheap Scandinavian furniture in our small Vermont town. Also this: I had three children under the age of four when we first moved here. This made hour-long drives to Vermont’s handful of big-box stores seem about as appealing as cleaning out a chicken coop with my tongue – and it made local shopping appear nearly as bad. Throughout our first summer in Vermont the only “live” shopping I could handle was buying groceries at Hannaford’s. 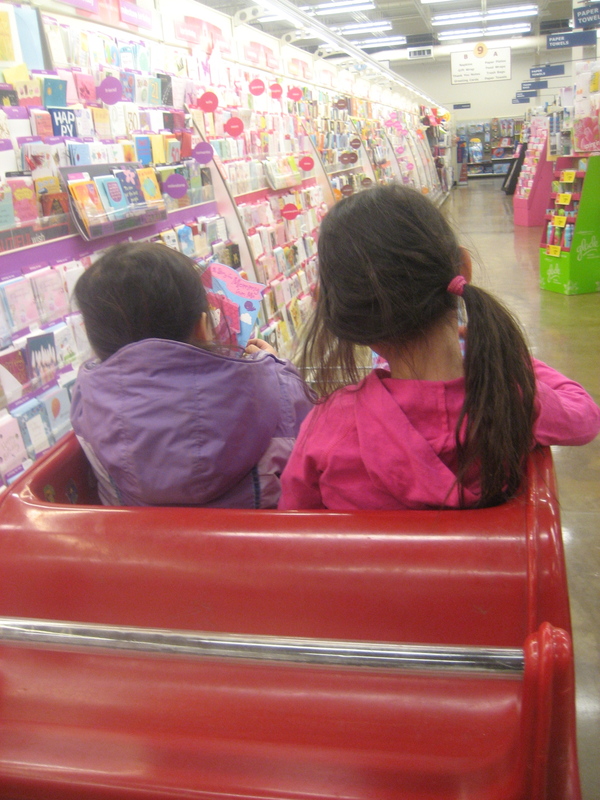 There, I could strap 2/3 of our children into an enormous, unwieldy “car cart” (a shopping cart combined with a two-seated plastic “car”), toss them free sugar cookies from the bakery (available for children under age 12), and be relatively sure that they’d last until check-out. Of course, if no car carts were available, I might as well give up and go home. Over time, however, I gradually ventured out to more local stores. The fact that our daughters were getting older and (generally) more presentable in public helped, of course. But it was more than that; I started to understand that shopping locally was an important aspect of life in a small-town community. It’s convenient to order what I need with a click of my keyboard and have it appear on my doorstep, but it’s also isolating. I don’t see anybody when I shop like that. Granted, many times I don’t want to see anybody when I’m shopping with my children. But part of shopping in a small town is thatyou always see somebody: from school, from church, from the office, from the neighborhood. Even the store clerks know us by now. This keeps me humble, but it also keeps me human; as a stay-at-home mom, interactions while running errands may be the only grown-up conversations I have all day. I’m also encouraged by other people’s kindness; never have I been told so often, “You sure have your hands full!” Yes, I do! Occasionally there are longer conversations, when a fellow shopper (usually someone over the age of 60) takes the time to ask my daughters’ names and ages. These exchanges usually end with the other person saying something like, “Oh yes, we had seven children in five years on our dairy farm,” which makes me wonder why I’m feeling overwhelmed in the first place. None of that has ever happened while I was shopping online or in a big-box store. Another reason I like taking my business local is that, as much as I appreciate the ease and cheapness of big-box and online shopping, I don’t really want my town to become a typical American suburb, filled with generic chain stores. There are a handful of smaller chain stores here already, but, as in most Vermont towns, they’re located on the outskirts along with the car dealerships. Venture into our “historic downtown” area, and you’ll find a Main Street lined with locally owned small businesses. I want to support these businesses; it would break my heart to see our downtown become like so many others across America: a stretch of vacant storefronts. But most of the stores in town are surprisingly kid-friendly, and my daughters and I have found little pleasures in each that help us survive a morning of errands: there’s the basket of free peanuts at Paris Farmers’ Co-op, and the huge rack of Schliech animals by the Agway entrance, from which only the offer of a sticker at the cash register can distract my girls. The Vermont Book Shop has a great children’s section (they’ll also order out-of-print children’s books that we can’t find at the library), and there are fun magnets and wind-up toys by the check-out counter. Ben Franklin is usually a safe bet, provided I divert the girls to the toy section having prepared them for “looking, not buying.” And Junebug, a children’s resale boutique with a playroom off of the main store, might as well be public daycare as far as my kids are concerned. Even the car carts and sugar cookies of Hannaford’s pale as the weather warms. Come summer, we’ve discovered the fun of picking our own fruit at any number of wonderful local orchards. And between May and October, we bypass the Hannaford’s produce section entirely, opting instead for a weekly CSA share at Elmer Farm, where the girls play with their friends while I select fresh vegetables from the farm stand and pick flowers from the garden. There will always be some things I can’t get in town, so I’m not sure that I’ll ever fully wean myself from online shopping. But these days, if I need something, I try to find it locally before turning to my computer. And that very act of pausing before I click “Submit Order” forces me to consider what I really need. So, in the end, shopping locally means that I shop purposefully, I shop communally, and I shop less – which is always a good thing! NOTE: The week I wrote this column I came across two wonderful (and local!) blog posts on shopping locally: one appeared on the parenting site Minibury, and the other was written by the owner of local shop Clementine.Give them a read!